West Ham UTD Academy, in Partnership with Shoreline FC of Greenwich CT are proud to announce our 3rd West Ham UTD ID camp. Last year we had several players from our camp invited to the National Camp in Georgia. And following on from that, one of our own players has just returned from a 7day trip in London, training with the West Ham UTD Academy. An unbelievable experience for any player!! 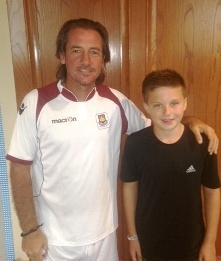 West Ham United Football Club has arguably one of the greatest Youth Academies in the world. In recent years, the likes of Rio Ferdinand, Frank Lampard, Michael Carrick, Joe Cole and Glen Johnson are all graduates of the West Ham United Academy. The West Ham United International Academy is excited to offer an ID Camp in Greenwich CT, in conjunction with our new Partner Club, Shoreline FC. The camp is open to U8 - U18 boys & girls and will be overseen by a senior member of the West Ham United International Academy coaching staff. The camp will consist of coaching methods and exercises taken directly from the West Ham United Academy in London, England. Players excelling at this camp (along with players all over the USA) will be invited to the 2013 West Ham United International Academy National Residential Camp, staffed by the West Ham United Academy coaching staff and directed by West Ham United's Academy Director Tony Carr. Tony Carr and his staff will be looking for players excelling at the National Camp, to offer them the chance of a lifetime to travel to London and train with the West Ham United Academy!! !